For the song by Craig Morgan, see International Harvester (song). For the Swedish progg band, see Träd, Gräs & Stenar. Warder, Bushnell, and Glessner etc. The International Harvester Company (abbreviated first IHC and later IH) was a United States manufacturer of agricultural machinery, construction equipment, trucks, automobiles, and household and commercial products. Its reorganized successor, after spin-off of several of those businesses, is Navistar International. In 1902, J.P. Morgan merged the McCormick Harvesting Machine Company and Deering Harvester Company, along with three smaller agricultural equipment firms, to form International Harvester. In 1985, International Harvester sold off most of its agricultural division to Tenneco, Inc., which merged it into its subsidiary J.I. Case under the Case IH brand. Following the terms of IH's agreement with Tenneco, the remainder of International Harvester (primarily heavy trucks) became Navistar International Corporation in 1986. McCormick died in 1885, with his company passing to his son, Cyrus McCormick, Jr., whose antipathy and incompetence toward organized labor sparked the Haymarket affair, the origin of May Day as a labor holiday. In 1902, the McCormick Harvesting Machine Company and Deering Harvester Company, along with three smaller agricultural equipment firms (Milwaukee Harvesting Machine Co., Plano Manufacturing Co., and Warder, Bushnell, and Glessner—manufacturers of Champion brand) merged to create the International Harvester Company. Banker J.P. Morgan provided the financing. In 1919, the Parlin and Orendorff factory in Canton, Illinois, was a leader in the plow manufacturing industry. International Harvester purchased the factory, calling it the Canton Works; it continued production for many decades. In 1926, IH's Farmall Works began production in a new plant in Rock Island, Illinois, built solely to produce the new Farmall tractor. By 1930, the 100,000th Farmall was produced. IH next set their sights on introducing a true 'general-purpose' tractor designed to satisfy the needs of the average US family farmer. The resulting 'letter' series of Raymond Loewy-designed Farmall tractors in 1939 proved a huge success, and IH enjoyed a sales lead in tractors and related equipment that continued through much of the 1940s and 1950s, despite stiff competition from Ford, John Deere, and other tractor manufacturers. IH ranked 33rd among United States corporations in the value of World War II production contracts. In 1946 IH acquired a defense plant in Louisville, Kentucky, which was enlarged, expanded, and re-equipped for production of the Farmall A, B, and the new 340 tractors. Then in 1948, IH acquired the Metropolitan Body Company of Bridgeport, Connecticut. This was the manufacturing facility for the bodies of the commercially successful Metro line of forward control vans and trucks from 1938 until roughly 1964. In 1974, the five-millionth IHC tractor was produced at the Rock Island Farmall plant. Throughout the 1960s and 1970s, despite good sales, IH's profit margins remained slim. The continual addition of unrelated business lines created a somewhat unwieldy corporate organization, and the company found it difficult to focus on a primary business, be it agricultural equipment, construction equipment, or truck production. An overly conservative management, combined with a rigid policy of in-house promotions, tended to stifle new management strategies, as well as technical innovation. Products with increasingly ancient technology continued in production despite their marginal addition to sales. Worse, IH not only faced a threat of strong competition in each of its main businesses, but also had to contend with increased production costs, primarily due to labor and government-imposed environmental and safety regulations. In 1979, IH named a new CEO, who was determined to improve profit margins and drastically cut ballooning costs. Unprofitable model lines were terminated, and factory production curtailed. By the end of the year, IH profits were at their highest in 10 years, but cash reserves were still too low. Union members became increasingly irate over production cutbacks and other cost-cutting measures. In the spring and summer of 1979, IH began short-term planning for a strike that seemed inevitable. Then on November 1, IH announced figures showing that president and chairman Archie McCardell received a $1.8 million (in 1979 values) bonus. McCardell sought overtime, work rule, and other changes from the United Auto Workers, which led to a strike on November 2, 1979. Soon after, the economy turned unfavorable, and IH faced a financial crisis. The strike lasted about six months. When it ended, IH had lost almost $600 million (in 1979 value; over $2 billion today). Following the merger, tractor production at Harvester's Rock Island, Illinois, Farmall Works ceased in May 1985. Production of the new Case IH tractors moved to the J.I. Case Tractor Works in Racine, Wisconsin. Production of IH Axial-Flow combines continued at the East Moline, Illinois, combine factory. Harvester's Memphis Works in Memphis, Tennessee, was closed and cotton picker production was moved. The truck and engine divisions remained, and in 1986, Harvester changed the corporate name to Navistar International Corporation (Harvester had sold the International Harvester name and the IH symbol to Tenneco Inc. as part of the sale of its agricultural products division). Navistar International Corporation continues to manufacture medium- and heavy-duty trucks, school buses, and engines under the International brand name. The International Harvester Agricultural Division was second to the Truck Division, but was the best-known IH subsidiary. When IH sold the agricultural products division to Tenneco in 1985, the International Harvester name and "IH" logo, went with it. One of the early products (besides the harvesting equipment that McCormick and Deering had been making prior to the merger) from the newly created International Harvester Company was the Traction Truck: a truck frame manufactured by Morton Traction Truck Company (later bought by IHC) with an IHC engine installed. From 1902, when IH was formed, to the early 1920s, the McCormick and Deering dealerships kept their original brands unique, with Mogul tractors sold at McCormick dealers, and Titan tractors at Deering dealerships, due to the still-present competitiveness of the former rivals. IH produced a range of large gasoline-powered farm tractors under the Mogul and Titan brands. Sold by McCormick dealers, the Type C Mogul was little more than a stationary engine on a tractor chassis, fitted with friction drive (one speed forward, one reverse). Between 1911 and 1914, 862 Moguls were built. These tractors had varied success, but the trend going into the mid-1910s was "small" and "cheap". The first important tractors from IH were the model 10-20 and 15-30. Introduced in 1915, the tractors (which were smaller than their predecessors) were primarily used as traction engines to pull plows and for belt work on threshing machines. The 10-20 and 15-30 both had separate, but similar, Mogul and Titan versions. Around this time, IHC purchased a number of smaller companies to incorporate their products into the IH dealer arsenal. Parlin & Orendorff - P&O Plow and Chattanooga Plow were purchased in 1919. Other brand names they incorporated include Keystone, D.M. Osborne, Kemp, Meadows, Sterling, Weber, Plano, and Champion. In 1924 IH, introduced the Farmall tractor, a smaller general-purpose tractor, to fend off competition from the Ford Motor Company's Fordson tractors. The Farmall was a leader in the emerging row-crop tractor category. Following the introduction of the Farmall, IH introduced several similar-looking "F Series" models that offered improvements over the original design (the original model became known as the "Regular"). In 1932, IH produced their first diesel engine, in the McCormick-Deering TD-40 crawler. This engine started on gasoline, then switched over to diesel fuel. Diesel engines of this era were difficult to start in cold weather, and using gasoline allowed the engine to start easily and thoroughly warm up before making the switch to diesel in all weather conditions. In 1935, this engine was put in the International Harvester WD-40, becoming the first diesel tractor on wheels in North America (the world's first diesel tractor was the German Benz-Sendling BS 6, introduced in 1922). For model year 1939, industrial designer Raymond Loewy was hired to design a new line of tractors. The sleek look, combined with other new features, created what is known as the Farmall "letter series" (A, B, BN, C, H, and M) and the McCormick-Deering "standard series" (W-4, W-6, and W-9). Model year 1941 had the introduction of the model MD, the first rowcrop diesel-powered tractor; over a decade later, IH's largest competitor, John Deere, introduced a diesel option on their rowcrop tractors. The letter series tractors were updated to the "super" series in 1953 (with the exception of the A, which had become a "super" in 1947, and the B and BN, which were discontinued in 1948) and received several improvements. Many of these tractors (especially the largest: the H, M, and W models) are still in operation on farms today. Especially desirable are the diesel-powered MD, WD-6, and WD-9. These tractors carried forward the unique gasoline start diesel concept of the WD-40. The letter and standard series of tractors was produced until 1954, and was a defining product in IH history. In 1947, the smallest tractor in the Farmall line was introduced, the Cub. With a 60 cu. in. four-cylinder engine and a 69-inch wheelbase, the Cub was aimed at small farms such as truck farms, horse farms, and other small acreages that had previously continued to rely on horse-drawn equipment. Like the various John Deere L/LA/LI models, one of the "mechanization-resistant" markets it hoped to penetrate was the small, poor, one-mule family farms of the rural American Deep South, but the Cub also sold to owners of larger farms who required a second tractor. Production of the Cub commenced at the newly acquired Farmall Works-Louisville plant (formerly the wartime Curtiss-Wright Aircraft factory in Louisville, Kentucky) which was expanded, remodeled, and re-equipped. Selling for $545.00 in 1947, the Cub proved extremely popular, and the original design continued in production without significant alteration until 1979. For 1955 in IH tractors, the numbered "hundred-series" was offered. Although given slightly different looks and few new features, they were still updates to the models introduced in 1939. The only new tractor in the 1955 lineup was the 300 Utility. In 1957, IH gave the tractor lineup another update by increasing power in some models, adding a new 230 Utility model, adding new white paint to the grill and sides, and giving new number designations. This improved sales at the time, but IH's inability to change and update was already showing. In July 1958, IH launched a major campaign to introduce a new line of tractors to revitalize slumping sales. At the Hinsdale, Illinois, Testing Farm, IH entertained over 12,000 dealers from over 25 countries. IH showed off their new "60" series of tractors: including the big, first-of-its-kind, six-cylinder 460 and 560 tractors. The joy of the new line of tractors was short lived, though. One of the first events that eventually led to the downfall of IH presented itself in 1959. In June of that year, IH recalled the 460, 560, and 660 tractors: final drive components had failed. IH, which wanted to be the first big-power manufacturer, had failed dramatically by not upgrading the final drives on the new six-cylinder tractors. These final drives were essentially unchanged from 1939 and would fail rapidly under the stress of the more powerful 60-series engines. IH's competitors took advantage of the recall, and IH lost customers in the ensuing months, with many customers moving to John Deere's New Generation of Power tractors introduced in 1960. Throughout the 1960s, IH introduced new tractors and new sales techniques. As producing tractors was the lifeblood of the company, IH would have to remain competitive in this field. They both succeeded and failed at this goal, but farming was about to change, and IH and its competitors were in for a bumpy ride. In 1963, IH introduced the 73 hp (54 kW) 706 and 95 hp (71 kW) 806 tractors. In 1964, IH made its four-millionth tractor, an 806. In 1965, IH introduced its first 100 hp (75 kW) two-wheel-drive tractor, the 1206. Another option became available in 1965 for the 706, 806, and the new 1206: a factory-installed cab (made by Stopler Allen Co.). This cab is often called the "ice cream box" cab due to its shape. The cab could be equipped with a fan and heater. By 1967, over 100,000 models 706, 806, and 1206 were built. The 276 International Harvester was also built at this time becoming popular for smaller farms with tighter lanes and fields due to mobility and weight making the 276 a popular seller boosting International Harvester's slim profits. In 1967 was the introduction of the "56" series tractors as replacements for the successful and popular "06" series. These new "56s" were bigger and more powerful than the "06s". The new models included the 65 hp (48 kW) 656, 76 hp (57 kW) 756, the 101 hp (75 kW) 856, and the 116 hp (87 kW) 1256. The "ice cream box" cab was still an option. In 1969 IH introduced the 1456 Turbo at 131 hp (98 kW). Also that year, the 91 hp (68 kW) 826 was introduced with the option of gearshift or hydrostatic transmissions. The "ice cream box" cab was dropped and replaced with the new "custom" cab made by Exel Industries, which could be equipped with factory air-conditioning, heat, and an AM radio. Another milestone for IH was the 1970 introduction of the 1026 Hydro which was basically a hydrostatic version of the 1256, at that time the most powerful hydrostatic transmission tractor made in the US at 114 hp (85 kW). In 1971, IH introduced the 66 series line. The new models included the 85 hp (63 kW) 766, the 101 hp (75 kW) 966, the 125 hp (93 kW) 1066 turbo, the 145 hp (108 kW) 1466 Turbo, and the 145 hp (108 kW) 1468 V-8. The 130 hp (97 kW) 4166 4WD was also introduced. The 966 and 1066 were available with Hydro or gearshift transmissions and the choice of two-post roll over protection structures (ROPs) or two different cabs, the "custom" and the "deluxe". Both could be equipped with air conditioning, heat, and AM-FM radios. In 1972, the 666 replaced the long-running 656, the 150 hp (110 kW) 1568 V-8 replaced the 1468, and the 160 hp (120 kW) 1566 and the 163 hp (122 kW) 4366 4WD were introduced. Also later that year, four-post ROPs replaced two-post; the "custom" cab was dropped and the "deluxe" cab was now painted red instead of white. Due to horsepower confusions, the 966 and 1066 Hydro models were restriped; the Hydro 100 and the 666 Hydro became the Hydro 70. On February 1, 1974, at 9:00 am, the five-millionth tractor came off the assembly line at the Farmall Plant in Illinois. IH was the first tractor manufacturer to accomplish this. Also in 1973, IH officially dropped the "Farmall" name from its tractor. This ended an era that began with the first Farmall "Regular" back in 1924. The 230 hp (170 kW) 4568 V-8 4WD was introduced in 1975. In 1976, the entire tractor line got a new paint job and decal pattern. No longer were the side panels all white with chrome and black decals: they were now all red with a black-striped sticker. This was done to clear inventory for the forthcoming Pro Ag Line. In September 1976, IH released their 86 series Pro Ag Line. The models included the 80 hp (60 kW) 786, the 90 hp (67 kW) 886, the 101 hp (75 kW) 986, the 104 hp (78 kW) 186 Hydro, the 135 hp (101 kW) 1086, the 146 hp (109 kW) 1486 and the 161 hp (120 kW) 1586. These new tractors had a new cab dubbed the Control Center that came standard with air conditioning, heat, and several radio-CB options. The driver sat well ahead of the rear axle and the fuel tank was mounted behind the cab over the rear axle. This increased balance and ride. Also in 1976, the 62 hp (46 kW) 686 along with the "86" series four-wheel-drives were introduced, including the 4186, 4586, and 4786. In 1977, International Harvester introduced the first Axial-Flow rotary combine. This machine, produced at East Moline, Illinois, was the first generation of over 30 years of Axial-Flow combines. In 1979, IH introduced two all-new tractors: the 3388 and 3588, known as the 2+2 4WD line. These tractors were the result of taking two 1086 rear ends and hooking them together with a transfer case. A year later, the 3788 was introduced. Although these tractors performed well in the field, they never sold well. As the 1980s began, IH faced a stable economy, yet an unknown fate. In September 1981, IH announced at a dealership meeting the new "50 Series" of tractors, which included the 136 hp (101 kW) 5088, the 162 hp (121 kW) 5288 and the 187 hp (139 kW) 5488. IH also released the "30 series", which included the 81 hp (60 kW) 3088, the 90 hp (67 kW) 3288, the 112 hp (84 kW) 3488Hydro, and the 113 hp (84 kW) 3688. These new tractors proved once again that IH was innovative. Designed and styled by IH industrial designer Gregg Montgomery (Montgomery Design International), the new stylish design of the 50 and 30 series changed the look of tractors from that time forward. IH spent over $29 million to develop this new series, and the result was the last great lineup of tractors from International Harvester. Many technology-related innovations were used in the new series. A computer monitoring system (Sentry) was developed, and IH became the first manufacturer to add a computer to a farm tractor. Other innovations included a "Z" shift pattern, an 18-speed synchronized transmission, a forward air-flow cooling system which sucked air from above the hood and blew it out the front grille, "Power Priority" three-pump hydraulic system, color-coded hydraulic lines and controls, and a new rear-hitch system. The 50 Series had an unprecedented three-year or 2,500-hour engine and drive-train warranty, which later became an industry standard. Although no new sales records were set, IH sold a respectable number of these tractors during their short production time. IH also released the "60 series 2+2s" and planned on making the "Super 70 series" 2+2s, but only a handful of these exist today. On May 14, 1985, the last IH tractor rolled off the factory line, a 5488 FWA. In the late 1970s, IH entered a deal with Spain's Enasa to build diesel engines there as Internacional de Motores. After a downturn in the market coupled to problems with Spain's entry into the European Economic Community threatened the profitability of this project, International Harvester withdrew in 1982. In return for being allowed to escape all conditions of the joint venture, IH lost their up-front investment in the engine plant and ended up selling British truck manufacturer Seddon Atkinson (which had belonged to IH since 1974) to Enasa in 1983. 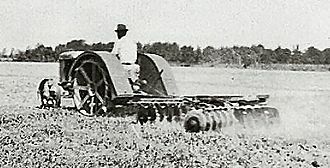 Along with the prominent tractor division, IH also sold several different types of farm-related equipment, such as balers, cultivators, combines (self-propelled and pull behind), combine heads, corn shellers, cotton pickers, manure spreaders, hay rakes, crop dusters, disk harrows, elevators, feed grinders, hammer mills, hay conditioners, milking machines, planters, mills, discs, plows, and miscellaneous equipment. Also produced were twine, stationary engines, loaders, and wagons. The Electrall system was introduced in 1954; it was a short-lived attempt to market electrically operated farm equipment and accessories. The system, co-developed with General Electric, consisted of a 208 V three-phase alternating-current generator connected with electric cables to the device to be powered. The generator could even power a household. A 10 kW Electrall generator was an option on the Farmall 400 tractor, and a 12.5 kW PTO-driven version was made. The possible applications of Electrall power were many, but few made it to market. IH marketing materials showed a haybaler being Electrall powered. One of the more novel applications of the Electrall was a device to electrocute insects in the field at night (basically like a modern-day bug zapper, but on a larger scale). IH is often remembered as a maker of relatively successful and innovative "light" lines of vehicles, competing directly against the Big Three. The most common were pickup trucks. IH made light trucks from 1907 to 1975, beginning with the Model A Auto Wagon (sometimes called the "Auto Buggy"). Production commenced in February 1907 at IH's McCormick Works in Chicago, although production was moved to Akron, Ohio, in October that year. Powered by a horizontally opposed, air-cooled twin around 15 hp (11 kW), it was a right-hand-drive model popular in rural areas for high ground clearance on the poor roads typical of the era. It featured a rear seat convertible to a carrier bed. The Auto Wagon was renamed the Motor Truck in 1910, and was a forerunner to the successful modern pickup truck. They were called IHC until 1914, when the 'International' name was first applied. The final light line truck was made on May 5, 1975. IH also had early success with the Auto Buggy, which started production in February 1907. In the mid-1940s, International released their K and KB series trucks, which were more simplistic than other trucks released in that era. This was followed by the L Series in 1949, which was replaced by the R Series in 1952, followed by the S line in 1955. In 1957, to celebrate IH's golden anniversary as a truck manufacturer, this was replaced by the new A line. 'A' stands for anniversary. With light modifications to its appearance, but more serious changes under the shell (and a number of new names), this design continued in production until replaced by the 1100D in late 1969, which looked very similar to the Scout. Corresponding with the truck "letter lines" was the Metro line of step (delivery) vans. Starting in 1938 and manufactured through 1975, the Metro series was produced and updated with each iteration of IH's truck lines. Also, special-use variants were sold, such as the Metro Coach (a bus version with windows and passenger seats) and Metro front-end section and chassis for full commercial customization. Additional variants were based on the medium-duty engine and chassis lines. One of the company's light-duty vehicles was the Travelall, which was similar in concept to the Chevrolet Suburban. The Travelette was a crew cab, available in two- or four-wheel drive. A three-door version was available starting in 1957, and a four-door version was available starting in 1961. The 1961 Travelette four-door (crewcab) was the first six-passenger, four-door truck of its time. The Scout, first introduced in 1961, is a small, two-door SUV, similar to a Jeep. In 1972, the Scout became the Scout II, and in 1974, Dana 44 axles, power steering, and power disc brakes became standard. After the Light Line pickups and Travelall were discontinued in 1975, the Scout Traveler and Terra became available, both with a longer wheelbase than a standard Scout II. IH abandoned sales of passenger vehicles in 1980 to concentrate on commercial trucks and school buses. Today, the pickups, Travelalls, and Scouts are minor cult orphaned vehicles. All were also available as rugged four-wheel drive off-road vehicles. The Scout and Light Truck parts business was sold to Scout/Light Line Distributors, Inc. in 1991. IH was an early manufacturer of medium- and heavy-duty trucks. Although based upon truck chassis, IH also became the leading manufacturer of the chassis portion of body-on-chassis conventional (type C) school buses. In 1962, IH offered the International Harvester Loadstar which became the premier medium-duty truck. In 1978, IH offered the International Harvester S-Series, which replaced the Loadstar in 1979. With the truck and engine divisions remaining following the 1985 sale of the agricultural division, International Harvester Company changed their corporate name to Navistar International in 1986. Today, Navistar International's subsidiary, International Truck and Engine Corporation, manufactures and markets trucks and engines under the International brand name. The Ford Power Stroke engine was manufactured by International Truck and Engine Corporation in Indianapolis, Ind., for use in Ford heavy-duty trucks, vans, and SUVs. 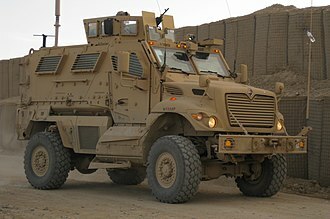 IH manufactured light, medium, and heavy vehicles for military use. Examples include a Metro van sold to the Czechoslovakian Army in 1938, as M5 Tractors and 2.5-ton M-5H-6 trucks for the US Navy and Marines in 1942, and around 3,500 2.5 ton M-5-6-318 cargo trucks provided mostly to Soviet Union and China. In the 1970s, motorhomes were manufactured using IHC engines and bare chassis. Most of the bodies were constructed of fiberglass. The association between International Harvester Australia and the Australian Army developed and in conjunction with the Army Design Establishment of the Australian Commonwealth Department of Supply, designed and constructed a range of trucks for the Australian Army. With the body loosely based upon the design of cab 13 of the Canadian Military Pattern truck, the first prototype built in 1959 was the International Truck Cargo 2½ Ton General Service, Australian No.1 Mk1. which was followed by the Mk2 prototype. A variant with a midmounted, 20,000-lb winch, resulted in the first production model, the Mk3 entering service in 1963 – just in time for Australia's entry into the Vietnam War. A five-ton 6X6 version was to follow with three major variants the Truck Cargo 5 Ton with winch F1 which replaced the Mk3 in Vietnam service. The F2 a tipper version that replaced the International Harvester AB160 "teaspoon Tipper" in both Vietnam and Borneo theatres of operations. The F5 wrecker with a lack of 4X4 2 1/2 ton trucks available because of the Vietnam War, the Mk3 was supplemented with further 4X4 production with the updated Mk4 version which shared the cab with the 6X6 variants Production of The Australian No.1. range of trucks were produced until 1973. The Mk3, Mk4, F1, F2 and F5 saw service until the late 1980s. The Australian designed and built International Australian A-line Cab Over (AACO) was first produced in the late 1960s and later in 1972 the Australian C-line Cab Over (ACCO) . The ACCO is a cab over engine type truck and has been offered in 4x2, 4x4, 6x2, 6x4, 8x4, and 10x4 configurations. Engines used have been Cummins, Caterpillar, Detroit Diesel, Perkins, Neuss or GMC with Road-Ranger or Allison transmissions and Rockwell differentials. The ACCO range were built to order, serving private operators, fire departments, military services, and municipal departments across Australia and New Zealand. The ACCO became the most popular product of International Harvester in Australia. The ACCO continues to be manufactured to date, under the ownership of Iveco. International Harvester Máquinas S.A. was established with Brazilian government support as part of a project to develop a vehicle industry there. 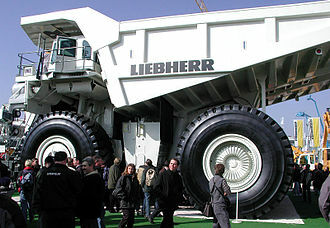 Their first product was the International S-184 heavy truck. In 1966 Chrysler purchased International's Brazilian plant. The first-generation Loadstar was primarily used for local delivery, including school buses and fire engines. It was also used extensively in the agricultural and construction industries. It was widely recognizable by its grey grill and "butterfly" hood, but some late models had one-piece tilting hoods. Most had a medium-duty 4x2 chassis, but some 6x4 heavy-duty models were built. This series was replaced by the S-Series in the 1970s. The heavy-duty Fleetstar was a short-hood conventional replacing the heaviest-duty R-Series conventionals. Designed primarily for vocational use, the Fleetstar was configured with either single or tandem rear axles. As with the Loadstar, during its production, it was fitted with a "butterfly" hood; a tilting fiberglass hood later became an option. The Fleetstar was replaced by the S-Series after 1977. The CO-4000 was the first COE highway tractor designed entirely by International Harvester, replacing a generation of tilt-cab tractors derived from a Diamond T design. In what would become a design feature in its later COE tractors, the CO-4000 was distinguished by a large trapezoidal grille. The CO-4000 was replaced by the Transtar-series cabovers in 1968. Late 1970s International Transtar II "Eagle"
During 1968, the CO-4000 cab underwent a major redesign in an effort to accommodate larger-displacement diesel engines. Sharing the trapezoidal grille of the CO-4000, the Transtar added a black-trim exterior band to the grille, becoming a feature shared with the later Cargostar. In 1974,the Transtar II was introduced. Though externally identical, the Transtar II featured larger-displacement engines. The tilt-cab Cargostar began life in 1963, as the CO-Loadstar. A low-cab COE, the vehicle was designated as its own product line for 1970 with a widened cab. Similar in configuration to the Ford C-Series, the Cargostar was a medium-duty truck with both gasoline and diesel engines. The Cargostar was replaced by the International 400/500/700/900, produced by Nissan Diesel (UD) from 1986-1991. The Transtar conventional was introduced in 1971. A semitractor designed for regional and over-the-road shipping, the Transtar was available in two hood lengths, depending on engine specifications. In 1985, the long-hood Transtar was rebranded the International 9370, marking the start of the International 9000 series. In 1973, International Harvester developed an all-new severe-service conventional to replace its R 210/230 (introduced in 1960) and M-Series (introduced in 1964) trucks. Using the cab of the Transtar conventional, the Paystar 5000 was given flat steel fenders and a butterfly hood. Alongside its standard configuration, the Paystar was produced with a set-back front axle configuration, with various rear axle configurations. Following the development of the Transtar, the Paystar became the 5000i in 2000, and again the Paystar in 2008. In 2016, the International HX-Series replaced the Paystar (with which it shares its cab). The S-Series is a range of medium-duty conventional trucks that was introduced in 1977, consolidating the Loadstar and Fleetstar lines into a single product range. To do so, the S-Series was produced as a straight truck, semitractor, and as a cowled bus chassis. Along with medium-duty vehicles, the S-Series was also offered in severe-service configurations (slotted below the Paystar). In addition to single and tandem rear axles (named the F-Series), the model line was offered with a driven front axle (providing four/six wheel drive). Produced in two generations, the S-Series would outlive International Harvester by over 15 years. In 2001, medium-duty production ended, replaced by the 4000-series (today the Durastar) with severe-service trucks ending production in 2003 (eventually replaced by the Workstar). In 2004, the S-Series ended as Navistar produced its final conventional-style bus chassis of its generation. In 1981, International Harvester replaced the Transtar II with an all-new tilt-cab highway tractor. Making use of smaller-displacement diesel engines, the CO9670 XL introduced a wider cab, larger doors (shared with the Transtar 4000), and larger windshield with a nearly identical grille to the Transtar II. In 1988, a set-back front axle version was introduced, becoming the first cabover sold in North America with a completely flat floor. After 1998, the 9000-series cabovers ended production in the United States, with Navistar exporting the tooling; as of 2017, the model line remains in production outside of North America. IH branched out into the home lawn and garden business in the 1960s with its line of Cub Cadet equipment, which included riding and walk-behind lawn mowers and snow blowers. Also produced were compost shredders, rotary tillers, Cadet garden tractors, and power washers. The Cub Cadet line was sold to MTD Products in 1981. Although best known for farm equipment, IH produced home appliances for farmers and nonfarmers alike. This included refrigeration equipment such as refrigerators, air conditioners, and freezers. IH had a refrigeration division of its own, as did other vehicle manufacturers of the time: Ford had Philco, Chrysler had Airtemp, General Motors had Frigidaire, Nash-Kelvinator Corporation (and then American Motors) had Kelvinator, Studebaker had the Franklin Appliance Company, and Crosley had Crosley. The IH appliance division had originally been developed to manufacture commercial-grade items to farmers, most of whom had just received electricity by way of the many electrification projects in the U.S. before and after World War II. Among the offerings were milk coolers and walk-in freezers for produce and meat. Later on, IH courted the farmer's wife with kitchen refrigerators available in the latest designer styles. The IH spokeswoman for these products was Irma Harding, a factory trademark. These products were introduced in 1947 and sold for less than 10 years. The refrigeration division was sold to Whirlpool Corporation in 1955. Since the time of production was short, IH appliances are rare today. On the show Friends, the refrigerator in Monica's apartment is a circa 1950 International Harvester. In early 1951, the United States Army through the Springfield Armory contracted International Harvester to produce M1 rifles, and from 1953 to 1956 produced 337,623 rifles in total, according to the Army Ordnance Department. In 1959, International Harvester created a jet turbine-powered tractor called the International HT-341. It was donated to the Smithsonian Institution in 1967. ^ Popular Mechanics. Hearst Magazines. June 1941. Retrieved 2016-03-09. ^ "International Harvester". Antique Farming web site. Archived from the original on March 19, 2016. Retrieved November 20, 2016. ^ "1948 International Harvester Annual Report". International Harvester Company. 1949. Retrieved 12 August 2012. ^ "Navistar International: Information from". Answers.com. Retrieved 2012-09-29. ^ a b Leffingwell, Randy (2005). Farmall Eight Decades of Innovation. St. Paul, Minnesota: MBI Publishing. ISBN 978-0-7603-2136-2. ^ a b Placard at WDM. ^ "A History of John Deere Model R Tractors". Retrieved 2007-11-02. ^ a b c Updike, Kenneth (2000). International Harvester Tractors 1955–1985. Osceola, Wisconsin: MBI Publishing. ISBN 978-0-7603-0682-6. ^ Kennett, Pat (September 1982). "Intertruck: Spain". TRUCK: 27. ^ a b c Wendel, Charles (2004). 150 Years of International Harvester. Lola, Wisconsin: Krause Publications. ISBN 978-0-87349-928-6. ^ The mid-mount Electrall unit installs on the Super M-TA, Super W-6TA, 400, 450 and 560 tractors equipped with the I-PTO option. ^ "Insect Electrocution". Ag and Food Newsletter. 2 (14): 711. 1954-07-07. Retrieved 2008-11-27. ^ a b c d "International Harvester History: Trucks". International Harvester. 1961. ^ Placard at the Saskatchewan Western Development Museum, where the car was on display. ^ "Smithson International Truck Museum: Truck Collection". Rimbey, Alberta, Canada: Pas-ka-poo Historical Park. Retrieved 2011-08-26. ^ Carlsom, B Mitchell. "The Timeless Metro". Red Power. Sept/Oct, Nov/Dec, Jan/Feb. 27 & 28: 34–36. ^ "2 1/2-ton, 6x6 Trucks of WW II P2". Olive-drab.com. Retrieved 2016-03-09. ^ "Engines of the Red Army in WW2 – International M-5-6x4-318 with BM-13-16 Katiusha rocket launcher". O5m6.de. Retrieved 2016-03-09. ^ "The Army Inter Chapter – AR164". REMLR. Retrieved 2012-09-29. ^ "The Army Inter Chapter – AS161". REMLR. Retrieved 2012-09-29. ^ "The Army Inter – No.1, Mk.1". REMLR. Retrieved 2012-09-29. ^ "The Army Inter – No.1, Mk.3". REMLR. Retrieved 2012-09-29. ^ "The Army Inter – No.1, Mk.5, F1". REMLR. Retrieved 2012-09-29. ^ "The Army Inter – No.1, Mk.5, F2". REMLR. Retrieved 2012-09-29. ^ "The Army InterChapter – AB160 Teaspoon Tipper". REMLR. Retrieved 2012-09-29. ^ "The Army Inter – No.1, Mk.5, F5". REMLR. Retrieved 2012-09-29. ^ "The Army Inter – No.1, Mk.4". REMLR. Retrieved 2012-09-29. ^ "Defence Materiel Organisation - On Target August 2006". Defence.gov.au. Retrieved 2012-09-29. ^ "Australian Government, Department of Defence". Defence.gov.au. 2012-01-20. Retrieved 2012-09-29. ^ "ACCO turns 40". Iveco Australia. Archived from the original on 2014-05-13. ^ Shapiro, Helen (Winter 1991). "Determinants of Firm Entry into the Brazilian Automobile Manufacturing Industry, 1956–1968". The Business History Review. 65 (4, The Automobile Industry): 876–947. doi:10.2307/3117267. JSTOR 3117267. ^ "Farmall Cub • View topic – Bought a 182 Cub Cadet". Farmallcub.com. Retrieved 2012-09-29. ^ "Wisconsin Historical Society Frequently Asked Questions". Wisconsinhistory.org. Retrieved 2012-09-29. Wikimedia Commons has media related to International Harvester vehicles. John Pierpont J. P. Morgan was an American financier and banker who dominated corporate finance and industrial consolidation in late 19th and early 20th Century United States. In 1892, Morgan arranged the merger of Edison General Electric and he was instrumental in the creation of the United States Steel Corporation, International Harvester and AT&T. He directed the banking coalition that stopped the Panic of 1907 and he was the leading financier of the Progressive Era, and his dedication to efficiency and modernization helped transform American business. Morgan has been described as America’s greatest banker, Morgan died in Rome, Italy, in his sleep in 1913 at the age of 75, leaving his fortune and business to his son, John Pierpont Morgan, Jr. His fortune was estimated at only US$80 million, prompting John D. Rockefeller to say, Morgan was born into the influential Morgan family in Hartford and was raised there. He was the son of Junius Spencer Morgan and Juliet Pierpont, Pierpont, as he preferred to be known, had a varied education due in part to the plans of his father. In the fall of 1848, Pierpont transferred to the Hartford Public School and to the Episcopal Academy in Cheshire, boarding with the principal. In September 1851, Morgan passed the exam for The English High School of Boston. In the spring of 1852, an illness struck which was to more common as his life progressed. Rheumatic fever left him in so much pain that he could not walk and he convalesced there for almost a year, returned to the English High School in Boston to resume his studies. 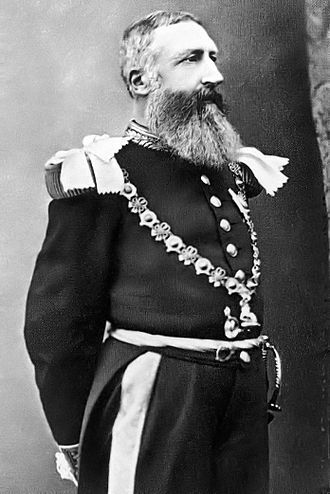 After he graduated, his father sent him to Bellerive, a school near the Swiss village of Vevey and his father sent him to the University of Göttingen in order to improve his German. He attained a level of German within six months and a degree in art history, traveled back to London via Wiesbaden. 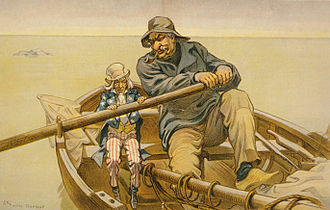 Morgan went into banking in 1857 at the London branch of merchant banking firm Peabody, in 1858, he moved to New York City to join the banking house of Duncan, Sherman & Company, the American representatives of George Peabody and Company. Cyrus Hall McCormick was an American inventor and businessperson, the founder of the McCormick Harvesting Machine Company, which became part of the International Harvester Company in 1902. From the Blue Ridge Mountains of Virginia, he and many members of his family became prominent residents of Chicago. Even greater than his achievement as an inventor was his success in the development of a company, with manufacturing, marketing. Cyrus McCormick was born on February 15,1809 in the Shenandoah Valley of Virginia and he was the eldest of eight children born to inventor Robert McCormick, Jr. and Mary Ann Polly Hall. As Cyrus father saw the potential of the design for a mechanical reaper and he worked for 28 years on a horse-drawn mechanical reaper to harvest grain, however, he was never able to reproduce a reliable version. He was aided by Jo Anderson, an enslaved African American on the McCormick plantation at the time, a few machines based on a design of Patrick Bell of Scotland were available in the United States in these years. The Bell machine was pushed by horses, the McCormick design was pulled by horses and cut the grain to one side of the team. Cyrus McCormick held one of his first demonstrations of mechanical reaping at the village of Steeles Tavern. He claimed to have developed a version of the reaper in 18 months. The young McCormick was granted a patent on the reaper on June 21,1834, none were sold, because the machine could not handle varying conditions. The McCormick family worked together in a smelting business. 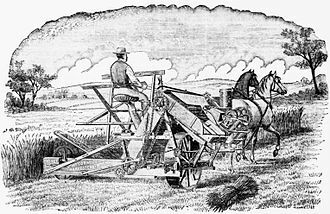 The panic of 1837 almost caused the family to go into bankruptcy when a partner pulled out, in 1839 McCormick started doing more public demonstrations of the reaper, but local farmers still thought the machine was unreliable. He did sell one in 1840, but none for 1841, using the endorsement of his fathers first customer for a machine built by McPhetrich, Cyrus continuously attempted to improve the design. He finally sold seven reapers in 1842,29 in 1843 and they were all built manually in the family farm shop. Being a traditional European spring celebration, May Day is a national public holiday in several European countries. The date is currently celebrated specifically as Labour Day or International Workers Day in the majority of countries, some countries celebrate a Labour Day on other dates significant to them, such as the United States, which celebrates Labor Day on the first Monday of September. Beginning in the late 19th century, as the union and labour movements grew. In the United States and Canada, a September holiday, called Labor or Labour Day, was first proposed in the 1880s. In 1882, Matthew Maguire, a machinist, first proposed a Labor Day holiday on the first Monday of September while serving as secretary of the Central Labor Union of New York. Others argue that it was first proposed by Peter J. McGuire of the American Federation of Labor in May 1882, after witnessing the annual festival held in Toronto. In 1887, Oregon was the first state of the United States to make it a public holiday. By the time it became a federal holiday in 1894. Thus by 1887 in North America, Labor Day was an established, official holiday but in September,1 May was chosen to be International Workers Day to commemorate the 4 May 1886 Haymarket affair in Chicago. The police were trying to disperse an assembly during a general strike for the eight-hour workday. The police responded by firing on the workers, killing four demonstrators, the following day on 5 May in Milwaukee Wisconsin, the state militia fired on a crowd of strikers killing seven, including a schoolboy and a man feeding chickens in his yard. May Day was formally recognised as an event at the Internationals second congress in 1891. Subsequently, the May Day riots of 1894 occurred, the congress made it mandatory upon the proletarian organisations of all countries to stop work on 1 May, wherever it is possible without injury to the workers. May Day has long been a point for demonstrations by various socialist and anarchist groups. May Day is one of the most important holidays in countries such as the Peoples Republic of China, North Korea, Cuba. Founded as part of the Congress of Industrial Organizations in the 1930s, the UAW grew rapidly from 1936 to the 1950s. Under the leadership of Walter Reuther it played a role in the liberal wing of the Democratic party, including the civil rights. UAW members in the 21st century work in industries as diverse as autos and auto parts, health care, casino gambling and higher education. Headquartered in Detroit, the union has more than 391,000 active members, the UAW currently has 1,150 contracts with some 1,600 employers. The UAW was founded in May 1935 in Detroit, the AFL had focused on organizing craft unions and avoided large factories. But at its 1935 convention, a caucus of industrial unions led by John L. Lewis formed the Committee for Industrial Organization, within one year, the AFL suspended the unions in the CIO, and these, including the UAW, formed the rival Congress of Industrial Organizations. It attracted young left-wing activists and Communists, in contrast to the older and that strike ended in February 1937 after Michigans governor Frank Murphy played the role of mediator, negotiating recognition of the UAW by General Motors. The next month, auto workers at Chrysler won recognition of the UAW as their representative in a sit-down strike, the UAWs next target was the Ford Motor Company, which had long resisted unionization. Ford manager Harry Bennett used brute force to keep the union out of Ford, and his Ford Service Department was set up as a security, intimidation. It was not reluctant to use violence against union organizers and sympathizers and it took until 1941 for Ford to agree to a collective bargaining agreement with the UAW. Communists provided many of the organizers and took control of key union locals, especially Local 600, the Communist faction controlled some of the key positions in the union, including the directorship of the Washington office, the research department, and the legal office. Walter Reuther, a power, at times cooperated closely with the Communists, but Reuther and his allies. The UAW was one of the first major unions that was willing to organize African-American workers, the UAW discovered that to be a successful bargaining agency with the corporation it had to be able to uphold its side of the bargain. A reaper is a farm implement or person that reaps crops at harvest, when they are ripe. Usually the crop involved is a cereal grass, all mechanical reapers cut the grass, most gather it, either by windrowing it or picking it up. Hay is harvested somewhat differently from grain, in modern haymaking, the machine cuts the grass is called a hay mower or, if integrated with a conditioner. As a manual task, cutting of grain and hay may be called reaping, involving scythes and cradles. Today reapers and grain binders have been replaced by combines in commercial farming. Reaping is usually distinguished from mowing, which uses similar implements, the stiffer, dryer straw of the cereal plants and the greener grasses for hay usually demand different blades on the machines. The reaped grain stalks are gathered into sheaves, tied with string or with a twist of straw, several sheaves are leant against each other with the ears off the ground to dry out, forming a stook. After drying, the sheaves are gathered from the field and stacked, being placed with the ears inwards, covered with thatch or a tarpaulin, in the British Isles a rick of sheaves is traditionally called a corn rick, to distinguish it from a hay rick. Ricks are made in an area inaccessible to livestock, called a rick-yard or stack-yard, the corn-rick is broken down and the sheaves threshed to separate the grain from the straw. Collecting spilt grain from the field after reaping is called gleaning, hand reaping is now rarely done in industrialized countries, but is still the normal method where machines are unavailable or where access for them is limited. The more or less skeletal figure of a reaper with a scythe – known as the Grim Reaper – is a personification of death in many Western traditions. In this metaphor, death harvests the living, like a farmer harvests the crops, a mechanical reaper or reaping machine is a mechanical, semi-automated device that harvests crops. Mechanical reapers and their descendant machines have been an important part of mechanised agriculture and it is believed that either Romans or the Belgae Gallics before them, invented a simple mechanical reaper that cut the ears without the straw and was pushed by oxen. Leander James McCormick was an American inventor, manufacturer and businessman and a member of the McCormick family of Chicago and Virginia. 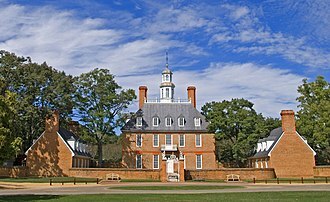 He owned and developed vast amounts of real estate in downtown Chicago and Lake Forest, in 1885 he donated one of the worlds largest telescopes to the University of Virginia. Leander James McCormick was a member of the prominent McCormick family of Chicago and he was born February 8,1819 in Rockbridge County, Virginia on February 8,1819 to Robert McCormick, Jr. and Mary Ann Polly Hall. His elder brother Robert Hall McCormick died as a teenager, and his father invented agricultural machines including the mechanical reaper, for which Leanders eldest brother Cyrus McCormick received the patent in 1834. Leander eventually developed multiple improvements to the reaper and received patents for two of them, with the remainder being patented by his brother Cyrus, at age 26, McCormick married Henrietta Maria Hamilton on her parents homestead, Locust Hill, in Rockbridge County on October 22,1845. The following year their father Robert McCormick, Jr. died, Leander had a third share of the reaper business, which amounted to 75 machines in 1846. In 1847 Leander helped Cyrus set up a factory in Cincinnati, in fall 1848 he moved to Chicago with his wife and infant son to join Cyrus in setting up an even larger factory. Another older brother William Sanderson McCormick joined in 1850 in a business in run by Cyrus to manufacture reapers and they created what eventually became the McCormick Harvesting Machine Company, with Leander taking over management of the manufacturing department, which he controlled for the next 30 years. By 1870, the McCormicks were one of the wealthiest families in the United States, his wife and children fled their burning home in the early morning hours. They moved to the west side of the city for the several years. The McCormicks, under Leanders direction, quickly rebuilt and recovered, by 1879, the business had fully recovered and was merged into a corporation. Leander stayed active in the management of the business until 1889 when he retired, after retiring from the business, McCormick invested heavily in real estate. Farmall was a model name and a brand name for tractors manufactured by the American company International Harvester. The Farmall name was presented as McCormick-Deering Farmall and McCormick Farmall in the evolving brand architecture of IH. Their origins were as row-crop tractors, a category that they helped establish, during the decades of Farmall production, most Farmalls were built for row-crop work, but many orchard and other variants were built. Thus Farmall was a prominent brand in the 20th-century trend toward the mechanization of agriculture in the US, the original Farmall is widely viewed as the first tractor to combine a set of traits that would define the row-crop tractor category, although competition in the category came quickly. Although it was not the first tractor to have any one of these traits, a tractor could yield lower overall operating costs than horses as long as it was priced right and reliable. The Farmall, mass-produced with the same ethos as the Ford Model T or Fordson tractor. The Farmall was thus similar to a Fordson in its capabilities and affordability and this latter step is what changed the financial picture to heavily favor the mechanization of agriculture. The Farmall was so successful at total horse replacement that it became a strong-selling product, with the success of the Farmall line, other manufacturers soon introduced similar general- to all-purpose tractors with varying success. In decades, the Farmall line continued to be a brand of all-purpose tractors. Its bright red color was a distinctive badge, during the 1940s and 1950s, the brand was ubiquitous in North American farming. However, many Farmalls remain in farming service, and many others are restored and collected by enthusiasts, in these respects, the Farmall era continues. This cultural development has brought a limited but notable revival of cultivating, being an amalgamation, IH, like General Motors, gradually evolved a brand architecture during the first half of the 20th century, when the concept was still new. Fordson was a brand name of tractors and trucks. The latter built trucks under the Fordson brand, further prototypes, with a dedicated tractor design, followed in 1916. With World War I raging in Europe, the first regular-production Henry Ford & Son tractors were exported to the U. K. in 1917 to expand British agriculture. In 1918, exports continued, the tractors began to be labeled as Fordsons, sales boomed in 1918 and 1919. As with cars, Ford never had the market to itself, Ford was the only automotive firm to sell cars and tractors simultaneously from 1917 to 1928. For a decade between 1928 and 1939, Ford of the U. S. left the tractor business, during that decade, Ford of England continued to build Fordsons and to develop new variants, which it exported widely. In 1939 Ford of the U. S. reentered the market with an all-new model. Ford of England continued to use the Fordson brand until 1964, Fordson production occurred in the U. S. Cork, and at Dagenham, England. Tens of thousands of Fordsons, most from the U. S.
Soviet Fordson clones were built at Leningrad from 1924 and at Stalingrad from 1930. Henry Ford grew up in a family of farmers in Wayne County a few miles from Detroit. At the time, farm work was arduous, because on the typical farm virtually nothing could get done without manual labour or animal labour as the motive power. As his interest in automobiles grew, he expressed a desire to lift the burden of farming from flesh and blood and place it on steel. In the early 20th century, he began to build experimental tractors from automobile components, four years after founding the Ford Motor Company in 1903, Ford finished his first experimental tractor in 1907 on Woodward Avenue in Detroit, referring to it as the Automobile Plow. Approximately 600 gasoline-powered tractors were in use on American farms in 1908, Fordson tractor design was headed by Eugene Farkas and József Galamb, both involved in the design of the successful Ford Model T automobile. Traction engines had been around for a while, but they were large, heavy, in the early 1910s, North America and Europe were hungry for small, inexpensive tractors, and many people seized on the Model T as a platform with which to create them. Benjamin Head Warder was an American manufacturer of agricultural machinery. In 1902, the company he co-founded merged with four others to form International Harvester. He was one of the 9 children of Jeremiah Warder and Ann Aston, Quakers from Philadelphia, Jeremiah had been a member of his fathers shipping firm, John Warder & Sons. John Warder had invested in Ohio land, and bequeathed Jeremiah $10,000 in land. In 1850, Benjamin co-founded Warder, Brokaw & Child Company, and paid $30,000 for patent rights to The Champion, Warders company manufactured the machines, but distribution was shared, at first, with Whiteley and others. By 1860, the Springfield firm was just Warder & Child, in 1866, it was reorganized as Warder, Mitchell & Company, with John J. Glessner and Asa S. Bushnell as junior partners. Senior partner Ross Mitchell retired in 1880, and the firm became Warder and it manufactured harvesting machinery – reapers, binders and hay rakes – under the Champion brand name. Warder and Bushnell managed the factories in Springfield, which covered 20 acres, by 1886, the company employed more than 1000 workers, and was exporting to foreign countries. In 1908, the 2,000, 000th Champion machine was sold, Ohios nickname, The Champion City, comes from the companys brand name. Warder retired from business in 1886, and moved his family to Washington, DC, boston architect Henry Hobson Richardson is credited with the design, but died four months into the project. Richardsons successor firm, Shepley and Coolidge, completed the house in 1888. Upon moving to Washington, Warder purchased the late Asa Whitneys country estate of Whitney Close from the heirs of Catherine M. Whitney on June 4,1886 and he immediately set about subdividing the 43 acre tract of land into building lots for a new community named Whitney Close. This was followed by the subdivision and development of other properties in the area. These subdivisions—including Whitney Close, Schuetzen Park, and Bellevue—were organized into a neighborhood known as Park View in 1908. Park Views Warder Street commemorates Warders role in founding the neighborhood, as a memorial to his parents, he commissioned Shepley and Coolidge to design a new public library for Springfield, Ohio. Agricultural machinery is machinery used in farming or other agriculture. There are many types of equipment, from hand tools and power tools to tractors. Diverse arrays of equipment are used in organic and nonorganic farming. Especially since the advent of mechanised agriculture, agricultural machinery is an part of how the world is fed. With the coming of the Industrial Revolution and the development of complicated machines. Instead of harvesting grain by hand with a blade, wheeled machines cut a continuous swath. Instead of threshing the grain by beating it with sticks, threshing machines separated the seeds from the heads, the first tractors appeared in the late 19th century. Power for agricultural machinery was supplied by ox or other domesticated animals. With the invention of power came the portable engine, and the traction engine. Agricultural steam engines took over the heavy pulling work of oxen, the steam-powered machines were low-powered by todays standards but, because of their size and their low gear ratios, they could provide a large drawbar pull. Their slow speed led farmers to comment that tractors had two speeds and damn slow, the internal combustion engine, first the petrol engine, and diesel engines, became the main source of power for the next generation of tractors. These engines contributed to the development of the self-propelled, combined harvester and thresher, instead of cutting the grain stalks and transporting them to a stationary threshing machine, these combines cut and separated the grain while moving continuously through the field. Combines might have taken the job away from tractors. They are used to push implements—machines that till the ground, plant seed, tillage implements prepare the soil for planting by loosening the soil and killing weeds or competing plants. The best-known is the plow, the ancient implement that was upgraded in 1838 by John Deere. Plows are now used frequently in the U. S. than formerly, with offset disks used instead to turn over the soil. The most common type of seeder is called a planter, and spaces seeds out equally in long rows, some crops are planted by drills, which put out much more seed in rows less than a foot apart, blanketing the field with crops. Case IH is a brand of agricultural equipment. It was created in 1985 when Tenneco bought selected assets of the division from International Harvester. Today Case IH is owned by CNH Industrial, which in turn is controlled by the Italian investment company Exor. Case IH offers agricultural equipment, financial services, as well as parts and service support for farmers, Case IH has won many AE50 awards from the American Society of Agricultural and Biological Engineers, ASABE, for their products. Some of Case IH’s most famous equipment models include Axial-Flow combines, Magnum tractors, Case IH history began when, in 1842, Jerome Case founded Racine Threshing Machine Works on the strength of his innovative thresher. In 1869 Case expanded into the engine business and, by 1886. The companys founder died in 1891 at the age of 72, in 1892, Case was the first company to build a diesel-powered tractor. Case Company had three cars in the first Indianapolis 500, continuing to market the products under the Case name. Merging with International Harvester Agricultural Division to become Case IH In 1984 and they changed their brand name to Case International at first, and abbreviated that to Case IH. International Harvester had been in turmoil since 1980, but was still one of the largest tractor manufacturers in the world. In 1986, Case IH purchased Steiger Tractor and began producing their 4-wheel drive tractors under the Case IH name, in 1987, Case IH released the Case IH Magnum series, creating the first tractor to be built by Case and International Harvester together. In 1989, Case IH released the first Maxxum series tractor, in 1995, Case IH becomes the first agricultural manufacturer to release Advanced Farming Systems with global positioning system technology. In 1996, Case IH released the first Steiger Quadtrack, in 1997, Case IH took over Fortschritt. Fortschritt was an East German brand of tractors, combine harvesters and other agricultural machines made by VEB Fortschritt in Neustadt, merging with New Holland to create CNH Global In 1999, Case IH merged with New Holland Ag to form a new parent company, CNH Global. A major appliance, or domestic appliance, is a large machine in home appliance used for routine housekeeping tasks such as cooking, washing laundry, or food preservation. An appliance is different from a plumbing fixture because it uses electricity or fuel, major appliances differ from small appliances because they are bigger and not portable. They are often considered fixtures and part of estate and as such they are often supplied to tenants as part of otherwise unfurnished rental properties. Major appliances may have electrical connections, connections to gas supplies, or special plumbing. This limits where they can be placed in a home, many major appliances are made of enamel-coated sheet steel which, in the middle 20th century, was usually white. The term white goods in contrast to brown goods, is used, primarily where British English is spoken. In the United States, the white goods can refer to linens. In New Zealand whiteware may be used, elsewhere a term from pottery, since major appliances in a home consume a significant amount of energy, they have become the objectives of programs to improve their energy efficiency in many countries. Navistar International headquarters building in Lisle, IL. Mikael Wiehe, one of the founding members of Hoola Bandoola Band. "Champion" farm machinery was distributed by multiple companies. Cyrus Hall McCormick portrait, held by the National Portrait Gallery in Washington, D.C.